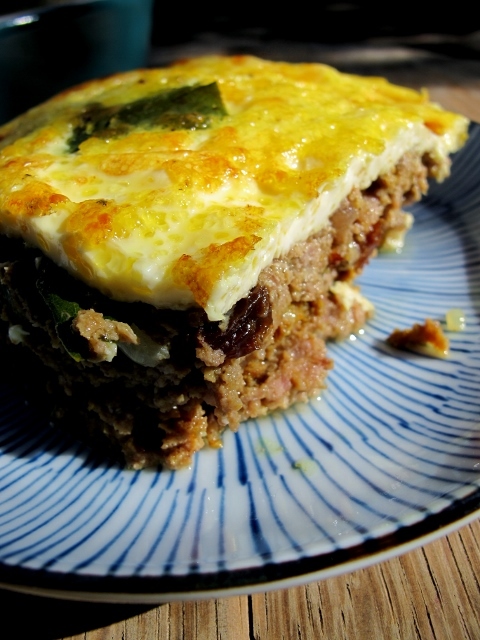 Unique to South Africa, bobotie is the platypus of international cuisine. Neither a pie nor a meatloaf, both sweet and savoury, bobotie is a hybrid dish that speaks to South Africa’s many cultures and tastes. Robustly spiced, spiked with sweet raisins and topped with a soothing savory custard, bobotie is deliciously complex whilst being reassuringly rustic. Almost always served with yellow rice and blatjangs, bobotie is typically most people’s first introduction to traditional South African food. For this reason bobotie has become synonymous with South Africa and is instantly recognisable as being an African favourite. Place all the ingredients (except the bread, bay leaves, milk and eggs) into a large bowl and mix well. Make sure that the ingredients are equally spread throughout the meat. Tear the soaked bread into small pieces and add to the meat mixture, mix well. Spread the mixture into an ovenproof baking dish. Push the mixture up on the sides of the dish to accommodate the contraction of the meat as it cooks. Press the bay leaves onto the top of the mixture, taking care to lay them out in accordance to how you intend dividing up the bobotie later. Cover with foil and bake for 20 minutes. After that remove the foil and bake for another 10 to 15 minutes. In the meantime, add the eggs to the milk along with some salt and pepper. Whisk well to combine. Take the bobotie out of the oven. During the cooking process, the meat will have contracted and come away from the sides of the dish. Press the meat back into the dish (I use a potato masher for this). Return the dish to the hot oven and then carefully pour the milk mixture over the meat. Continue baking until the milk topping turns golden, about 15 to 20 minutes. Serve with: Traditionally served with yellow rice (see below) and various condiments called blatjangs. Typically these would consist of sliced banana, extra chutney, pickled beetroot and a fresh tomato salsa (see below).